In our previous devblog we talked about some of the changes we had in mind for the flight model overhaul. In case you’ve missed our announcement, our Propulsion Update will launch on November 20th. Check out this devblog for more detailed information! The basic control scheme of the game has not changed, but we have added a bunch of optional control features and mechanics that can be toggled on and off, depending on your preference and play style! Inertia dampeners: When enabled, your ship will automatically attempt to come to a stop and stop any sideways velocity. When disabled, your ship will continue heading in the direction of thrust allowing you to freely spin around and attempt cool tricks! Along with these optional control systems, we’ve added the ability to manually thrust sideways, allowing you to make fine adjustments, evade projectiles and obstacles, and make docking much easier. Of course, you’re going to need some new parts to benefit from all these new mechanics! We’ve added gyros to help your ship rotate. This is especially useful on larger ships (frigates and up) that have a lot of mass. They come in two sizes: a small version that needs to be placed in a wall corner, and a large one that takes two wall tiles and a regular tile with a passage through it. Wing boosters are small engines mounted on wings on the side of your ship. They provide your ship with some additional low-end power, allowing ships (especially larger ones fitted with ion engines) to accelerate faster. On smaller ships, these boosters may be used instead of main engines, though it should be noted that they don’t provide any rotational, sideways or braking thrust. Brake boosters are mounted in the same way as wing boosters, except backwards. They help your ship slow down and reverse. Again, this is mostly useful for larger ships where your main engines may not provide enough braking thrust. Multi Boosters are also mounted on the side of your ship, and essentially combine wing and brake boosters in a single part. Side thrusters are already in the game, but now their functionality has changed. They previously had the functionality that gyros now provide, which made little sense. Now they do what you’d expect them to do: thrust sideways! Though main engines do provide a tiny amount of sideways thrust, without side thrusters you really can’t fly very effectively any more on anything larger than the smallest corvettes. Omni thrusters are the top of the line manoeuvrability parts. These large side-mounted thrusters can swivel 180 degrees, and thus provide precise thrust in all directions. They help your ship go forwards, backwards and sideways! Besides these new parts, we’ve made some changes to the main engines. Chemical engines have been left unchanged. They still provide plenty of thrust (at a relatively low top-speed), have decent braking thrusters, and provide a bit of sideways thrust. The afterburner boost is left unchanged as well; it still provides a lot of extra thrust and speed as it consumes fuel. Plasma engines have a reduced braking and sideways thrust. You’ll likely want to add some of the new parts to your ship to be able to control it well. Additionally, the afterburner has been changed for a quick “pulse” ability. It consumes all your fuel at once and instantly blasts your ship to very high speeds! The Ion engine no longer provides anything but forwards thrust; albeit at an improved rate with a very high top speed. Additional thrusters are a must on ships with ion engines. Additionally, it has no active boost or other ability; instead it passively increases your cruise mode speed allowing you to travel long distances much more quickly. You can still mix and match main engine types, but only one ability can be active at the same time. 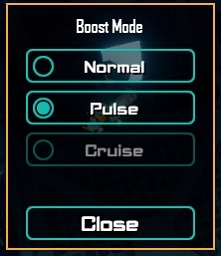 You can choose which one by walking up to, and interacting with any engine or thruster on your ship and choosing your perferred boost mode. The Landinar: Into the Void Propulsion Update will launch on Steam on November 20th. Join us for a special devstream on Friday November 16th at 16:00 CET.